OCHA map showing approximate areas of Tripoli fighting (Photo: OCHA). 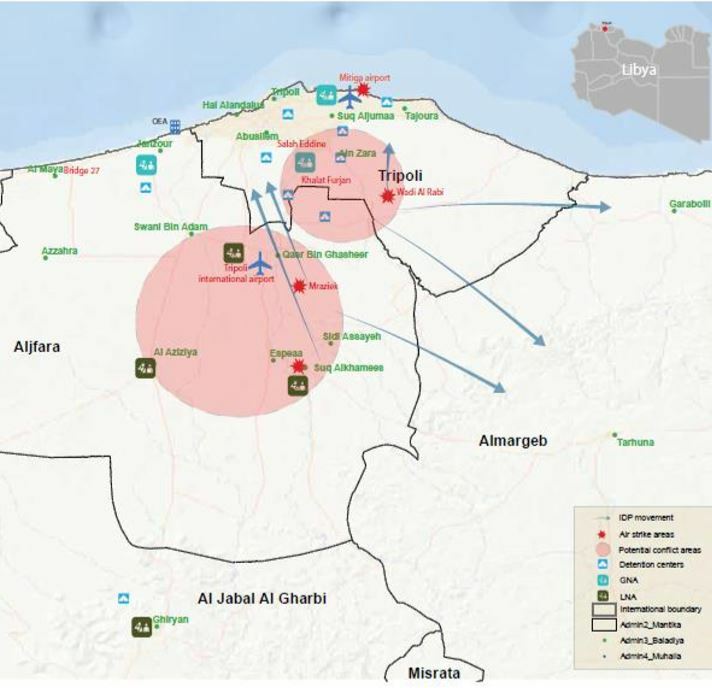 In its Situation Report issued yesterday, the United Nations Office for the Coordination of Humanitarian Affairs in Libya (OCHA) reported that ‘‘A further escalation of violence in and around Tripoli led to an upsurge in displacement, with 1,675 new displacements reported over the last 24 hours’’. It added that the humanitarian community is further ‘‘alarmed by reports that emergency service providers are often unable to reach civilians in need, and in some cases reported to have been targeted by parties to the conflict’’. The security situation in and around Tripoli remained ‘‘volatile, with continued armed clashes reported on the Wadi al-Rabie, the Qasr Ben Gashir and the Ain Zara axes, and airstrikes from both sides in Souq alKhamis and al-Shwayrif’’. It said that ‘‘severe protection concerns prevail, as the escalation of violence is taking an increasing toll on the civilian population. Many civilians in Libya and detained refugees and migrants are currently unable to flee the violence due to their proximity to the conflict’’. The OCHA report said that ‘‘over 500,000 children living in Tripoli are at immediate threat and tens of thousands more in other areas could become potentially affected. The ability of emergency services to access civilians in need remains restricted, including the Libyan entities who are evacuating families from conflict-affected areas in southern Tripoli, such as Hay Al-Kayekh, Wadi Al-Rabee, Ain Zara, Qasr Ben Ghashir, Al-Naqlia and Azizia’’. ‘‘Emergency service providers have reported incidents where they were not permitted by armed actors to access areas with civilians in need, and incidents where they felt they were targeted by armed forces. Reports were received of two aid workers being killed whilst on duty’’. In light of the current insecurity in Libya’s capital, the report said that the UNHCR relocated more than 150 refugees from the Ain Zara detention centre in south Tripoli to UNHCR’s Gathering and Departure Facility on 09 April. This relocation of detained refugees was the first relocation since the recent escalation of violence. The report said that the Humanitarian Coordinator urged all parties to the conflict in a statement to guarantee unhindered humanitarian access, unconditional medical evacuations and the protection and safety of civilians caught up in conflict zones. On the humanitarian supply side, the report said that the humanitarian partners have prepositioned aid supplies in multiple locations throughout Tripoli to respond to humanitarian needs, provided safe access can be granted. This includes food stocks to support an additional 80,000 people for a period of two weeks, pre-positioned emergency medical supplies and trauma kits, in addition to previously supplies medical items to eleven health facilities, and shelter and non-food items assistance to support 15,000 families across Libya. On food security, the report said that the World Food Programme (WFP) yesterday delivered two-week dry ration for 500 Persons of Concerns to the Gathering and Departure Facility under an agreement with UNHCR. The same day, some 100 households in Tajoura were provided with food, (as well as NFIs.) WFP’s food provisions will be delivered and distributed to 100 households in Ain Zara in the coming days. Yesterday, the Food Security Sector called for an ad-hoc meeting to discuss the provision of food assistance at the detention centers in Qasr Ben Ghasheer, Sabaa and Tajoura. The health sector, the report added, has collected data on civilian casualties from ten different sites and verified those numbers with focal points. As per those numbers, a total of eleven civilian casualties could be confirmed and verified, five of them dead, including an ambulance driver who was killed yesterday. This is the third health worker to be killed since the flare-up of the conflict. These numbers may not capture all civilian casualties, and do not include numbers of deceased or injured fighter.